I am thinking about a second career as a dancer. After this Pilates class I went to yesterday, I think I am qualified! This woman who runs this class downtown just kills you. We did hundreds of ballet kicks, toes pointed, front, back, side. That is a snapshot up above of me doing those kicks! OK, actually it is Leonard Pennario's friend Tamara Toumanova. But hey, I could do what she was doing. It was misery after a point, I will not deny that. At the end of the class I was just lying on my mat like a dead person. Plus although my weight is, ahem, within the normal range, I am a little fat to be a dancer. There is this move where you lie on your side and lift both your legs. This was not exactly new. We have had to do it before, to the extent that actually I have gotten good at it. But all I can think of is the cover of this memoir, "Chance and Circumstance," by Carolyn Brown, one of the lead dancers of the Merce Cunningham company. That is an excellent book, by the way. It is one of those books I go back to now and then. There she is, doing that move! On the cover of her book! And I was doing that move too. As a matter of fact I think I was doing it a little better than she was! And I probably had to hold it for longer. Well, that is neither here nor there. My point is, that must be a respected dance move. I mean, if she put it on the cover of her book, she has to be pretty proud of it. And I can do it. 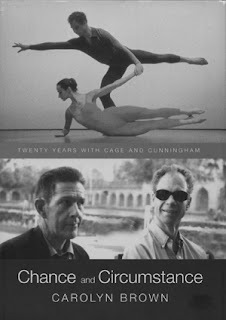 Now that I think about it we also had to do that move Merce Cunningham is doing over her head. Yes, I am sure we did that move. The crazy things we do in the name of fitness!